After all, if your flight is too expensive, you probably aren’t going anywhere. Every day the airlines have thousands of killer deals — from mistakenly published fares to special promotions deals to slashing prices to compete with another airline. Cheap fares are out there if you know how to find them. Today, I am going to help you master finding a cheap flight in 2019. These are the exact steps I’ve been following for a decade to get the cheapest airfare possible. If you follow them too, you’ll never be the person on a flight who paid the most for their ticket! Travel Hack Your Way to Free Flights! Stop paying full price! 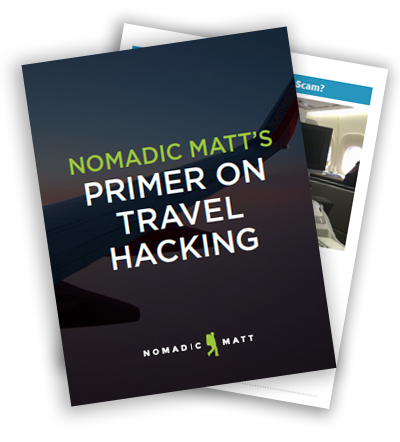 Download our free guide to travel hacking and learn how I travel the world for free! It is NOT cheaper to buy airfare on a Tuesday. There is NO evidence that searching incognito leads to cheaper deals. There is NO exact date or specific time period in which to book your airfare. You can’t predict airline prices and websites that do are basically taking an educated (but probably wrong) guess. Airlines used advanced computer and pricing algorithms to determine prices and run sales based on the time of the year, passenger demand, weather, major events/festivals, time of day, competitor prices, and much more. Those old “tricks” don’t work anymore. The system is too smart. Throw them out. Let them die. And don’t listen to anyone who tells you otherwise. Anyone who is telling you doesn’t know what they are talking about! Airline ticket prices vary greatly depending on the day of the week, time of year, and upcoming holidays, such as Christmas, New Year’s Eve, Thanksgiving, or the Fourth of July. August is a big month for traveling around Europe, and everyone wants to go somewhere warm in the winter or travel when the kids are out of school. If you are going to fly when everyone is flying, then you’re ticket is going to cost more. Try to be flexible with your dates. If you are dead-set on visiting Paris, go to Paris in the spring or fall when fewer people visit and airfares are cheaper. But if you want to go in the middle of August? You’re out of luck. Hawaii over Christmas? Good luck! Moreover, it’s always cheaper to fly during the middle of the week than on a weekend, because most people travel on the weekends and airlines hike their prices then. Prices are also cheaper if you fly after a major holiday as are early-morning or late-night flights are cheaper because fewer people want to travel then (who wants to wake up early?!). The difference of one day can mean hundreds of dollars in savings. Airlines are not dumb. They know when a festival, holiday, major sports event, or school break is coming up — and they raise prices accordingly. Be flexible when you fly and you’ll start way ahead of everyone else! If you can’t be flexible when you fly, at least be flexible with where you fly. It’s best to be both, but if you really want to save the most money and get a cheap flight for your trip, you should at least do one! The truth about airfare is that there’s always a deal to some destination, and if you’re flexible on where you want to go, you’ll always get a deal! When you are locked into one place at one time, you are stuck with whatever price shows up. No voodoo can change that. When you become flexible, suddenly the entire world opens up to you and you’ll find amazing cheap airfare! Years ago, if you wanted to fly between continents, you were mostly stuck with traditional expensive airlines. That’s no longer true. Budget airlines now service many long-haul routes, making it possible to fly around the world for very little money. Norwegian Airlines allows you to fly between Europe and Bangkok for about $250 each way. AirAsia offers crazy-cheap deals around Asia and Australia for as little as $100 each way. Indian and Middle Eastern airlines offer cheap flights throughout the subcontinent and Africa. You can fly most of the way around the world on a budget airline! Just be sure to watch out for fees. That’s how they make money! Budget airlines sometimes charge fees for checked bags, carry-ons, printing your boarding pass, using a credit card, and anything else they can get away with. Be sure to add up the cost of the ticket AND the fees to make sure that the price is lower than a larger carrier. Not only does it help to be flexible with dates and destinations but being flexible with the route you take is another way to get a cheap flight. Sometimes it’s cheaper to fly to London and take a budget airline to Amsterdam than to fly direct to Amsterdam. There are so many budget carriers around the world that taking advantage of a good deal to another city and then hopping on a budget flight to your destination is sometimes the best way to go. I had to go to Paris once; the flight was $900 USD, but I could fly to Dublin for $600 and get a $60 flight to Paris. It meant more flying time, but the $240 I saved was worth it. To do this, I find out how much it is to go directly to my destination. Then I open Google Flights and type in that destination’s continent to look at prices to nearby airports. If the difference is more than $150, I look to see how much it is to get from the second airport to my primary destination. Airwander is another good website that lets you see stopovers and compares the prices. Unlike Google Flights, they also show budget airlines. Be sure to have at least 3 hours between connections as booking tickets on different airlines will mean that if something goes wrong, you can’t just get put seamlessly on the next flight. Your second airline won’t care you were late since they didn’t fly them on the first place! This method is more work as you have to figure out lots of different routes and check different airlines – and connecting adds more time to your journey. But it will shave even more money off your flight, giving you extra to spend at your destination. You need to search multiple websites as you can in order to ensure you are leaving no stone unturned. Many search sites don’t list budget carriers because those airlines don’t want to pay a booking commission while others don’t list booking sites that aren’t in English! Then some only feed prices directly from airlines. You aren’t going to find AirAsia, Ryanair, or most other budget airlines on large sites like Kayak, Expedia, or Orbitz. U.S. booking sites also tend to not have the obscure foreign airlines that you see on international sites like Skyscanner or Momondo. In short, not all flight search websites are created equal and all have their pros and cons. Momondo – This is my favorite website. They search the most airlines and websites in the world and come back with cheaper flights 92% of the time. Google Flights – Great search engine that lets you see prices for multiple destinations. Typically, I start all my searches with Momondo because it searches all major AND budget airlines, non-English websites, English websites, and everything in between. I’ve been using them since 2008 and they vet all the sites they link to as they have strict criteria on who the operate with. Momondo is one of the most comprehensive booking sites out there, they have the lowest price 99% of the time, and it’s the search engine all the other travel experts I know use too. So while the others are good and should not be ignored, Momondo should be your starting point! If you are a student (or under 26), there are many, many discounts available to you. You can usually find prices 20-30% off the standard fare. Travel agencies like STA Travel or Flight Centre can help find you a cheap ticket. Don’t overlook them! While you are booking Air Canada, on one of the legs you’re flying their partner airline, Swiss Air. You’re stuck with the price Air Canada charges. Airline rewards programs are a great way to get free flights, free upgrades, and free companion tickets. No matter how often you fly, you should be signed up for the airline’s reward program. I stick to US-based airlines since they are involved in all the major alliances and you can earn miles on their partner flights. For example, if I fly Singapore Airlines, I can earn United Airlines miles because they are partners. Likewise, if I fly Air France, it’s credited to my Delta rewards account. Airfarewatchdog – Great for searching US flight deals. The Flight Deal – Great for global flight deals. Holiday Pirates – The best for European flight deals. Scott’s Cheap Flights – The BEST for US flight deals. Secret Flying – A great site for flight deals from around the world. Don’t search for or buy multiple tickets in a single purchase. Airlines always show the highest ticket price in a group of tickets. For example, if you are a family of four and searching for four seats, the airline will find four seats together and show your fare based on the highest ticket price. So if seat A is $200, seats B and C are $300, and seat D is $400, it will price those tickets as $400 each instead of adding up the individual ticket prices. Therefore, always search for tickets as a single person. Afterwards, in the checkout process, you can pick your seats so you and your family are sitting together. If your country’s currency is currently strong compared to others around the world, search airfare in a country where the currency is weaker. For example, the US dollar is strong and the New Zealand currency is weak. I found a one-way flight from Australia to NYC for $1,000 USD but when I searched on the NZ version of the airline, I found the same ticket for $600 USD. It’s the same airline, same flight, and same booking class. It was just booked in a different currency. This tip does not always work, but it works often enough that it’s something worth trying if your currency is currently doing well. Airline fares will keep rising the closer you get to departure, but there is a sweet spot when the airlines begin to either lower or increase fares based on demand. Don’t wait until the last second but don’t book far, far in advance either. 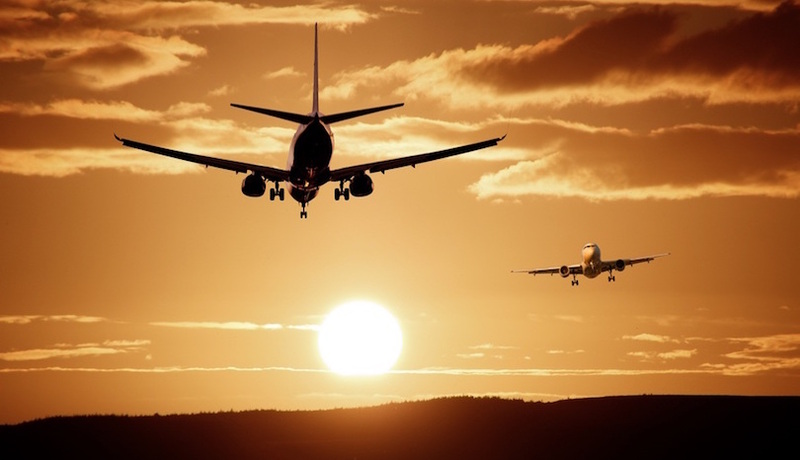 The best time to book your flight is around 6–8 weeks before your departure, or around three months before if you are going to your destination during their peak season. ****Finding a cheap flight is about being flexible and smart in where you go, when you go, and how you get there. Follow the tips above, but don’t waste forever finding a cheap flight. If you’re spending more than an hour booking a flight, you’re spending too much time. Spend 30-40 minutes finding and booking a cheap flight at a price you’re OK paying and move on with your life. I never second-guess myself on flights. You’ll go crazy if you do. If you follow the tips above on how to get a cheap flight, you’ll always get a great deal, save yourself time, stress, and avoid being the person who paid the most for their ticket! I start all my searches with Momondo because they search all major AND budget airlines, non-English websites, English websites, and everything in between. Even if you aren’t sure your plans, it’s best to start searching for flights today. People who wait to book are people who end up spending the most. Disclosure: Please note that some of the links above are affiliate links. At no additional cost to you, I earn a commission if you make a purchase. If you have any questions about the companies or my status as an affiliate, please don’t hesitate to e-mail me.